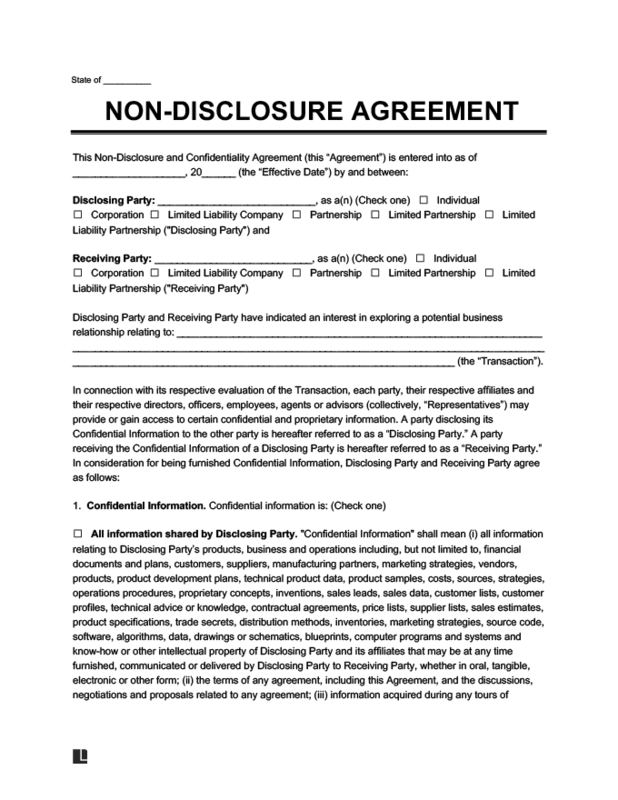 Use our attorney-drafted Interview Non-Disclosure Agreement to protect your company from any disclosure of information made to a candidate who applies for a position. Prevent the disclosure of sensitive information by your employees. The Basics: What is an Interview Candidate NDA? Not quite what you’re looking for? View all of our legal forms here. 2. The Basics: What is an Interview Candidate NDA? An interview candidate non-disclosure agreement (NDA), otherwise known as an interview confidentiality agreement, protects your company from any disclosure of information made to a candidate who applies for a position. Many companies have employee NDAs that protect their proprietary information and trade secrets. However, candidates who are in the application process will not have signed those employee agreements. An interview NDA allows you to more thoroughly vet candidates without concern over divulging information that they might take to other companies or make public. The need for an interview confidentiality agreement depends on the industry, and type of position you’re filling. Most often, interview non-disclosure agreements are signed by high-level candidates or those who would be working with proprietary data and programs. However, if you have trade secrets that are worked on more broadly within your organization, it’s acceptable to use this document for positions big and small to ensure that your critical information doesn’t get leaked to your competitors. When you decide to get this document signed is up to you. You could provide it prior to the meeting so that they can bring in a signed copy, or have it signed on your company premises, but before being escorted to any area where sensitive information would be seen or discussed. Providing an interview confidentiality agreement is a perfectly normal part of hiring for positions where sensitive information needs to be discussed. It allows you to be more honest and thorough during the interview process, which allows for a better assessment of how well a candidate would meet requirements for the position and fit in with the current company culture. Interview NDAs are a standard fixture of many well-known companies including Google and Facebook. If you have sensitive information you want to protect, it will pay to take the extra step to draft this legal document. The most logical consequence of not using an interview NDA is that the candidates you interview might leak information, intentionally or accidentally. They might also bring information back to their current or future place of employment. Without a signed contract, you’ll have no recourse in those scenarios. Alternately, many companies who don’t use interview candidate non-disclosure agreements won’t discuss sensitive information within the interview. This possibility can keep your information more secure but it can often mean a less productive interview process. The ability to thoroughly discuss responsibilities and future projects for the role can give the interviewer essential information to make a more accurate assessment of candidates. This document is often used for candidates being interviewed to fill sensitive positions. Some companies will use it for all interview processes, though that may depend on the availability of company sensitive or proprietary information throughout your organization. Keeping in mind that many companies received hundreds of resumes to fill a single position and may schedule dozens of interviews, there can be a great deal of risk involved in having that many people see the inner workings of your company. An interviewee doesn’t have any vested interest in the success or failure of the company so they may be more likely to be careless about sensitive information. The document can also be used in cases where your company is considering working with a contractor or partnering with another entity for the purpose of one or several projects. It is also important for the interview NDA to include a sentence that clarifies that in return for having signed the NDA, the interviewee is able to interview. The contract should clearly state the company name and the interviewee’s legal name. It may also delineate terminology for parties, such as referring to the interviewee as “applicant”. The contract should stipulate what position the prospective employee is interviewing to fill. There should be a section within the NDA that stipulates that the agreement serves to protect the company from disclosures that can harm their interests in the marketplace, etc. The contract should clearly stipulate information which can’t be discussed outside of the interview. This might include trade secrets, products, and unique information the company adds to the NDA. One clause that many companies add to their NDA is that interviewees may not disclose information pertinent to another entity, such as their current or past place of employment. This protects the company from liability in the event that their products or upcoming projects appear similar to a competing entity through chance. The contract is legally binding after it’s signed and dated. Your company will likely interview a great many candidates who are never hired on a permanent or temporary basis. None of those interviewees can be covered under a standard employee NDA. The interview candidate non-disclosure agreement offers some legal protection against theft of intellectual property in these scenarios.